Virtual reality has been an idea in many of the science fiction and popular futuristic movies for decades. Scenes portray characters using virtual reality and becoming completely immersed in a new and different world that is controlled and created by computers. What were once only the dreams of sci-fi enthusiasts has become an extremely popular and highly engineered technology that is working to make those dreams a reality. In recent years, the changes to virtual reality have been monumental, with huge steps being taken to immerse an individual in a world that does not exist beyond the screen. 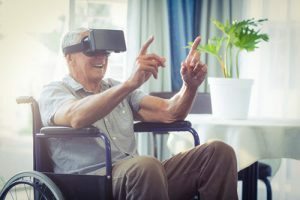 Although Virtual Reality has been around for decades, it wasn’t until now that this up-and-coming new technology had the ability to provide unique individuals with personalized and special experiences that they may be unable to perform on their own without specialized help. The possibilities of virtual reality are just beginning to be understood as the new technology is still in its infancy. Virtual reality technology is also creating new opportunities for doctors and physicians to be able to perform surgeries and operations from afar with precision and accuracy. The high costs of virtual reality are slowly decreasing as more companies are releasing affordable options to experience virtual reality without breaking the bank. Google’s recent acquisition of the virtual reality company Oculus for $2 billion dollars has encouraged the wave of virtual reality engineers and designers to begin working on new and innovative ways to put this technology to the best use possible. 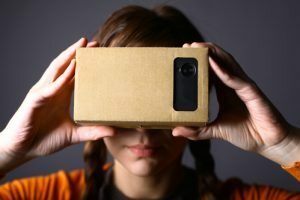 Having recently released a cardboard virtual reality kit for $10, Google is the first to create a cheap way for customers to experience virtual reality and all it has to offer without having them buy an expensive virtual reality headset and system. With a number of different colleges and scientists working on developing new virtual reality technologies, it is expected that a number of different virtual reality options will appear on the market. With a variety of options to choose from, the competition is sure to create more innovative products that will steadily open the market to more individuals such as physically unique people, veterans and the elderly, rather than simply virtual reality enthusiasts. With virtual reality in the infancy of its development, the possibilities for the technology are just now being explored. Companies like Google are currently incorporating virtual reality in many of the different applications that they already supply. Google’s street view, which allows users to look at any location throughout the world and see a first person view of the area, is one such application. Google is currently allowing those with virtual reality headsets the capability to see the location through a virtual reality headset as if they are there in real life. Google is currently working on a new project called Jump. This project allows average users the chance to record and take images in a three dimensional view. They can create and build their own virtual world that can be edited and worked on to provide a new and exciting experience for many individuals. With open outsourcing programs like Jump, people who would have nothing to do with virtual reality are finding it easier to become more involved in this new and rapidly changing industry. Colleges and universities like Stanford are paving the path for engineers who wish to create virtual worlds and environments that will fully immerse the user as if they were really there. The students and engineers at Stanford are currently studying humans in the first Virtual Human Interaction Lab. This lab is designed to determine the effects of virtual reality on able-bodied humans as well as those who are physically unique. They already have conducted research trials on how able-bodied people are able to perform in a virtual reality where they are disabled and how being disabled in a virtual reality world affects them after the virtual reality experience is over. 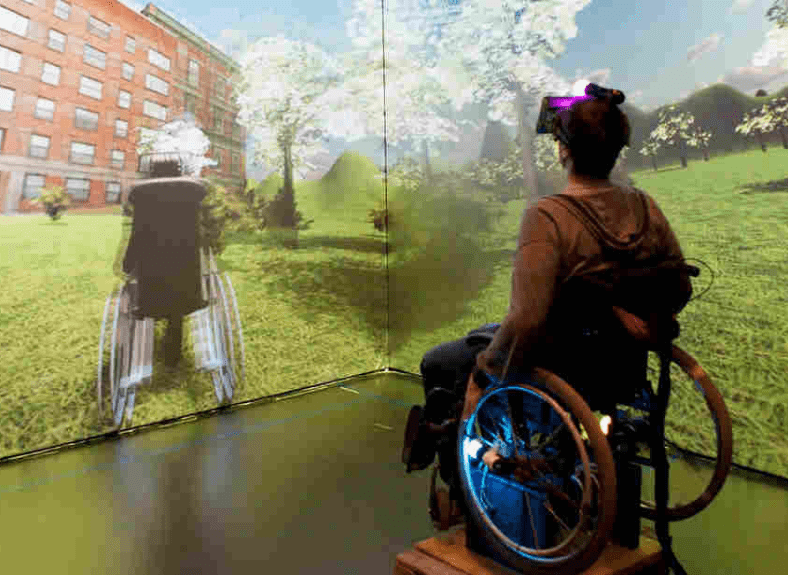 Stanford’s study of virtual reality placed able-bodied participants in the body of those who are wheelchair bound or unable to use their legs. These people were able to gain a new understanding of their bodies. Some people also were given extra appendages in this virtual reality world to see how they would cope with these changes and adapt to their new bodies, and other participants were given the experience of color blindness within the virtual reality world to see what those who are affected by this ailment feel on a daily basis. Upon completion of this study, many of the participants said they were more likely to voluntarily assist people with these differences in real life than they were before. Stanford’s study on human experience and the effects of virtual reality goes even further as to experiment on physically unique individuals by encompassing them in a virtual reality where they have full function of their bodies. 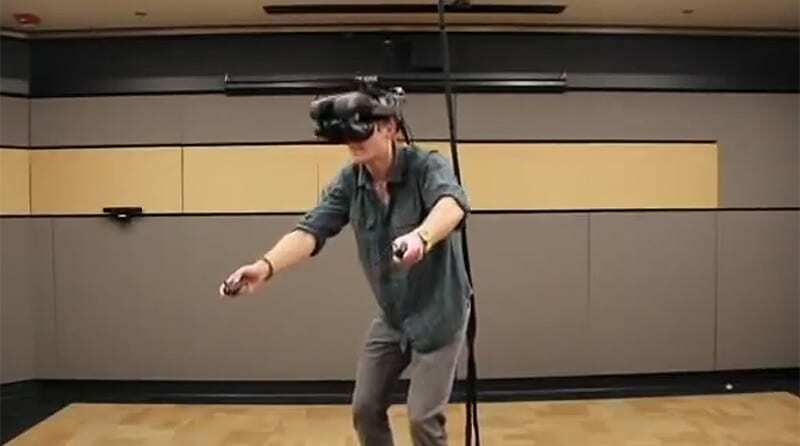 Many unique individuals who have experienced this for the first time are astounded at the feeling of a fully functioning body, although it is only during the virtual reality experience. Those who are physically unique have claimed that through these virtual reality experiences, it is possible for them to experience something that was truly thought to be impossible to them before. Through the virtual reality lab at Stanford University, scientists are expecting to be able to reshape the homunculus of the body. The homunculus of the body is an internal map that resides within the brain that dictates the body and its functions. By changing the way that the brain recognizes the body, the overall outlook of the individual and the way they perceive things will forever be changed. Although virtual reality is a great tool in the aid of those who are physically unique, it also aids medical professionals in treating those same people. With the help of virtual reality, doctors and surgeons alike are capable of designing new limbs, practicing surgeries on virtual patients, creating more detailed and accessible designs of organs and body structure, and endless more possibilities. For those who may have previously lost limbs and are bound to a wheelchair, doctors and engineers have developed prosthetic limbs with the help of virtual reality and are currently using the same technology to develop lighter, more mobile and sturdier prosthetic limbs. By being able to fully create, destroy, and manipulate different designs for prosthetic limbs through virtual reality, it is possible for these professionals to design prosthetics based specifically on the patient and built with incredible longevity. Surgeries and other procedures have been developed and taken to unbelievable lengths with the help of virtual reality. Surgical simulations make it possible for surgeons to practice many different procedures on simulated devices with all of the realism of an actual surgery room and a live patient. Any problems or complications that may arise in a real surgery are programmed into these virtual reality situations to prepare the surgeon for many of the unexpected occurrences that happen in real life, making surgeries safer for patients and making surgeons much more confident in their abilities. Dr. Robert Massof, a medical professional at the Johns Hopkins University Wilmer Eye Institute, even altered a virtual reality headset from its traditional use to create a powerful magnification tool for use by individuals with chronic vision problems. Using a complicated combination of powerful magnification lenses, mirrors, and video cameras, the device can help correct and alleviate common ocular issues and give people the opportunity to see better through this modified virtual reality headset. Although the use of virtual reality as an assistive device for physically unique individuals has little testing and experimenting thus far, those who have been lucky enough to experience it claim that it is well beyond what they previously thought could ever be done for them. For individuals who are unable to walk or use their legs, the opportunity for them to experience surfing, bike riding, walking, and various other mobile and athletic activities in a serene environment is a rare opportunity that previously was unavailable to people in their particular position. Those who have special needs and are physically unique do not require any special treatment in the world of virtual reality. This enables those people to experience places from around the world, perform activities they thought impossible, and play games like any other person would. Their limitations are no longer limitations but rather possibilities in the world of virtual reality. However, some setbacks have arisen for creating virtual reality software and devices for use by physically unique people. Setbacks such as creating games where movement is not restricted by wheelchairs or other helpful devices are slowly being overcome by engineers using new sensors in virtual reality devices that allow the user to use their head and hands to move their character along in the virtual reality world. For users who are unable to control and move their hands or head, more problems arise within the virtual reality community. However, if the users have control of a joystick, controller or some other similar device, it is possible to overcome these problems and still fully interact and play in a virtual reality world. Many companies are working in a variety of ways to create virtual reality devices and applications for users with very specific needs. These companies work with the unique individuals to create and design worlds specifically with that person and their ailments in mind. As more companies develop these programs for more diverse people, the technology can help improve quality of life for unique individuals. For many people who experience short or chronic pain, virtual reality can be seen as an outlet to rely on when the pain becomes unbearable. In a recent study at the University of Washington, Dr. Sam Sharar studied virtual reality and the effects it has on patients with irregular and chronic pain. His study showed that in many patients the virtual reality world has the chance of distracting the person from the pain they experience on a daily basis. Dr. Sharar claims that “Cognitive distraction during a painful experience takes some of the conscious away from the painful stimulus.” When patients who suffer from severe or chronic pain immerse themselves in a completely virtual world, their brain will be distracted with the environment and activities around them and think of that rather than the intense pain they are experiencing. [themedy_pullright colour=”red” colour_custom=”” text=”Cognitive distraction during a painful experience takes some of the conscious away from the painful stimulus”]Dr. Sharar and his team have created virtual worlds and games for those suffering from this type of intense pain. The doctors’ first game, called Cool!, was built specifically for those who experience anxiety, pain and helplessness, symptoms that often occur in those who recently went through a traumatically painful experience with lingering feelings and symptoms. This game was designed with innovative artificial intelligence that is able to detect the current state of the nerves of the user while they are playing the game. Currently Dr. Sharar and his team are working on a new game called SnowWorld that is designed specifically for burn victims to help aid in their healing process. The virtual reality world is designed with cool landscapes containing blue and white hues. 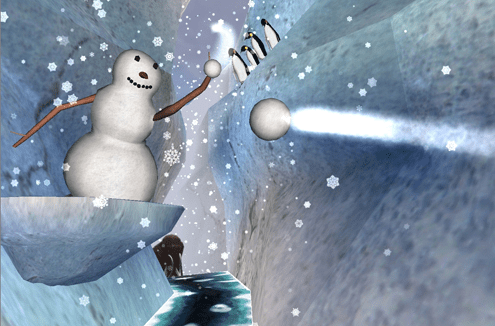 The user can play with snowmen, throw snowballs, and engage in games with icicles and snowy mountains. The music is specifically designed to fully immerse the user into the virtual reality world and help them truly escape the pain that they are experiencing in the real world. Dr. Sharar and his team, along with most other scientists who study this particular phenomenon, still do not fully understand why the full immersion of a patient into a virtual reality world diminishes the amount of pain they physically feel. One hypothesis is that the virtual reality world causes the brain of the user to produce endorphins that help mask the pain from the user. Although experiments are being conducted to find out the exact reason, there are still no definitive results. Dr. Diane Gromala, a sufferer of chronic pain herself, is discovering and creating new and ingenuous ways to help the over 100 million Americans that suffer from similar pain. Gromala’s team at the Chronic Pain Research Institute is currently working with these virtual reality technologies to interrupt the cognitive processes that the brain goes through in order to change the way pain is felt and the way it is perceived by the individual. Her use of biofeedback, which asks patients to focus on pain in order to produce thoughts about it, have proven to be an excellent sensor as to how much attention the pain is causing the patient and how the patient is reacting to it. Her specific virtual realities have worked on teaching the patients how to better control the pain rather than curing it. Empathy is the ability to understand and share the feelings of another, and one way to develop it could be through virtual reality. What was once unknown or misunderstood, could become an impressionable learning experience through scenarios that put you in another’s shoes. At the Oregon Research Institute, doctors and engineers were using virtual reality to help a young boy with Cerebral Palsy, five-year-old Christopher Cobbs. 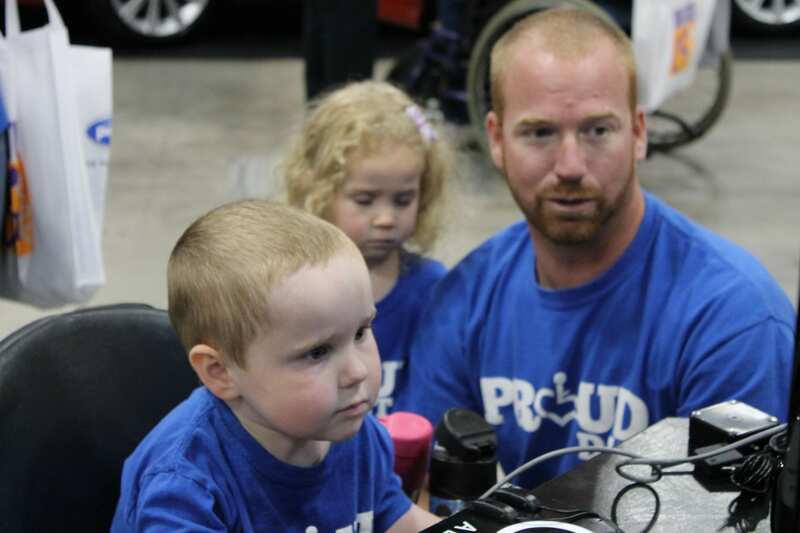 Christopher is using a virtual reality headset that creates an imaginary three-dimensional universe for him to help him learn how to control and operate a motorized wheelchair. His 3D world is filled with a variety of different types of terrains and scenarios. Grassy fields, icy streets and muddy sidewalks are all being conquered by Christopher in this virtual world. After traversing through these difficult terrains, Christopher is set to begin his navigation through more common areas such as crossing busy streets or travelling through the hallways of a busy elementary school. Christopher is learning all of this to prepare him for the real world and show him how he will navigate through the world using his wheelchair. This breakthrough occurred over twenty years ago. The Oregon Research Institute and Christopher worked with this level of virtual reality in April of 1994. Christopher Cobbs is now in his late twenties, and the development of virtual reality aids to help those who face physical challenges has only improved a miniscule amount until just recently. With such an innovative and practical use for virtual reality discovered over twenty years ago, it is hard to imagine that so little has been heard about this subject since. It was not until recently that the major opportunities and possibilities of these technologies with those who are physically unique are being picked up by the mainstream media and being publicized to a larger audience. Only after these amazing breakthroughs were publicized did more scientists and engineers decide to get involved and help this technology grow to its fullest potential. Out of Russia comes a social movement led by VRability, whose videos are created to motivate those with disabilities by putting them in the front row seat of other disabled people participating in sports activities. The videos are shot using GoPro’s 360 degree rig, which gives the viewer a wider view, with which they can focus on any aspect of. The video plays, but the view and angle you watch from is entirely up to you. Not only does VRability hope to empower those with disabilities to be more active, but they also hope a collaborative effort can come of this, and more organizations can work towards a shared goal of creating a more comfortable environment for all people. Links to virtual reality and helping those who suffer from PTSD go back as far as 1997 when Georgia Tech released their software program called Virtual Vietnam VR. There have been few studies that show what these technologies can do to help those who are suffering from PTSD. One particular study from the University of Southern California Institute for Creative Technologies found that virtual reality helped soldiers with PTSD cope with their experiences. Soldiers who have used virtual reality to help treat their PTSD recreate situations and circumstances that were once scary and traumatic to them. This is done in a controlled environment where they know they are safe. By viewing these scenarios in the controlled environment, the veterans learn how to control their responses to the flashbacks to reduce the trauma experienced and potentially diffuse the negative behaviors triggered by the memories. More notably, Virtual Reality is being used by the military to help soldiers prepare for wartime and the many experiences that they will go through during their tour of duty, rather than helping the soldiers post war. Although the in-depth virtual reality machines at these military outlets can be quite costly, the effectiveness of virtually immersing the soldier in the environment and landscape with the sounds and actions of battle in an effort to reduce PTSD in veterans is an expense that the military is willing to bear. [themedy_pullright colour=”yellow” colour_custom=”” text=”Virtual reality will have a special meaning for disabled people… it means that for moments in time they can forget their disabilities and be immersed in the game. I think it could be the greatest thing since sliced bread for some… because they can completely reshape their world for a minute”]Bartlet has claimed that the technology for virtual reality is sound. The problem lies in getting virtual reality into the mainstream market and allowing more users to utilize the advantages that virtual reality can create. Although many people view virtual reality as very physical in nature, the advantages of those who cannot physically perform the tasks may be just as great. When Xbox released their Xbox Kinect, a tool that allows users to move their bodies to control the Xbox and video games that are compatible, many people thought that this could ruin gaming for those who are physically unique. 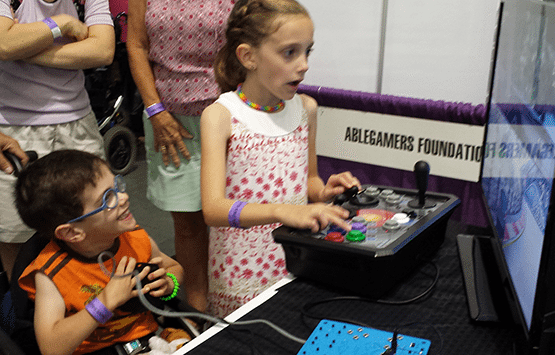 However, for many of those video game users who are bound to a wheelchair, Kinect actually offered them many benefits and advantages by allowing them to control the Xbox and its games using simply their voice. Although the gaming industry seems to be on the right track for creating new virtual reality systems and games, there is still a lot of work that needs to be done to fully accomplish the goal of using virtual reality to assist physically unique people. Virtual reality is still in a very early stage, and developing games and worlds that correspond with those games continues to be challenging. Bartlet and a few others are pioneering the movement in creating a world that allows for all gamers of all types to enjoy playing video games and immersing themselves in worlds other than their own current situation. Specular Theory – The company Specular Theory is currently developing and creating new virtual reality worlds aimed at helping unique individuals experience activities that they otherwise would not be able to achieve. Danny Kurtzman, who has Muscular Dystrophy, has been unable to experience many of the everyday experiences that physically-able people can. Kurtzman, who has experienced surfing on waves in the past, was only able to lie down on the board and get carried into the water with a team of twelve people. Recently with the help of Specular Theory, Kurtzman was able to experience surfing at a completely different perspective. [themedy_pullright colour=”yellow” colour_custom=”” text=”In the headset I could actually experience surfing standing up! It gave me that awesome feeling – that butterfly happiness feeling. It allowed me to experience something I thought I never could experience”]The team at Specular Theory creates this virtual reality experience by using proprietary software that films different surfers in different environments and records the exact movements they perform while they are actually out in the ocean surfing. The virtual reality experience through Specular Theory is not an interactive experience like many other virtual reality experiences, so the user cannot move their body and see the reaction in the video. Instead Specular Theory creates cinematic adventures that fully immerse the user into the environment that they have previously filmed. ALEH – ALEH is Israel’s largest network of facilities for children with severe cognitive issues or who are physically unique. Yael Shidlovsky Press, the occupational therapist at this organization, tailored this advanced virtual reality software for the more than one hundred residents of this facility. According to Press, these children do go on field trips and outdoors often but due to their physical capabilities are often limited to what they are able to do and achieve while on these field trips. These residents, who are between the ages of 6 and 30, are often in environments outside that could create hazards for them if they were to fully extend themselves beyond their limitations. Some of these residents who have wished to drive cars, fly planes, or simply pick flowers have been unable to do so throughout their entire lives due to the amount of strict rules they have been put under. With the help of Press’s research and the virtual reality program that has been implemented in this facility, it is possible for many of them to achieve their dreams without leaving the safety of the facility. “Research shows that virtual reality is more successful than standard approaches in motor and cognitive treatments because the simulated activities are perceived by the brain as real,” Press states. “For the cognitively disabled population, the use of VR through this system is innovative, challenging, and relatively little researched.” Despite the lack of research, it has been shown to be effective, which only proves that the possibilities affiliated with virtual reality are practically limitless. [themedy_pullright colour=”light-gray” colour_custom=”” text=”Research shows that virtual reality is more successful than standard approaches in motor and cognitive treatments because the simulated activities are perceived by the brain as real. For the cognitively disabled population, the use of VR through this system is innovative, challenging, and relatively little researched”]Press strongly believes that virtual reality can help people recover from serious illnesses such as strokes and those who lose cognition after accidents, so she created her own pilot virtual reality software in order to try and help those with these ailments. Press also acts as an occupational therapist consultant to the Health Services Department of the Israel Social Affairs and Social Services Ministry’s Division for Intellectual and Developmental Disabilities. Her knowledge of those who are physically unique goes well beyond that of the average person, and with so much experience in the field, she is certain she can create the tools needed to help physically unique people overcome and experience anything through virtual reality. Press claims that the invention of virtual reality and its technology, although originally intended for entertainment purposes, has clearly made big differences in some of her residents’ lives. One resident, who is a young girl they called “Einat”, was able to overcome the problems she was encountering when it came to defining colors and different shapes. Through the use of this new technology, she was able to copy a picture of a house which was then emailed to her father through the help of her occupational therapist. Her father, who was extremely proud of what his daughter accomplished, responded. This interaction created an open link for both Einat and her parents to communicate on a level that they were never able to before. Project BreakThru – The University of Georgia and the Georgia institute of Technology are currently developing a new program called BreakThru, which works to help physically unique students pursue STEM careers. BreakThru works to connect students who are physically unique with teachers and mentors in various areas of the world that promotes universal and unbiased learning for students interested in science, technology, engineering, and math based degrees. This program uses the technology that virtual reality allows to eliminate the boundaries and limitations that students may have in the traditional classroom and to help them reach teachers and mentors that otherwise would have been worlds away. Virtual reality is facing many problems when it comes to creating and developing this technology and making it accessible to all users. Although physically safe to use, some users are feeling and experiencing motion sickness and nausea, and others are developing symptoms of trauma. The actual cause of these problems is still unclear, as are their solutions. While studies have been conducted, scientists still have no concrete results on the effects that virtual reality has on the user’s brain and on their senses. Being completely immersed in a virtual world can have disorientating effects on the user, and some find it uncomfortable or even unbearable, which can obviously pose problems for the future of this technology. Releasing virtual reality products to the open market for purchase is also a setback that many companies seem to be facing. While it seems like a booming industry, many are still opposed to the idea of virtual reality becoming a dominant form for experiencing new lifestyles and environments. This lack of belief in virtual reality makes it hard for companies to generate the funding necessary to create and discover new possibilities in virtual reality. With such a new and innovative technology, it is impossible to know what the future has in store for virtual reality. The many different companies and people that are working on virtual reality and its possibilities are working at a tireless pace, creating new and unheard of technologies that are innovative and unique and will change the way people live their lives. For those who are physically unique, the possibilities that can be created with virtual reality are really endless. The new experiences that they may be able to go through and the places that they may be able to travel in this virtual reality world would be life changing for many of these people. In a world where physically unique people are limited by their capabilities, they will have the chance to fully realize the world and its endless opportunities in a virtual reality experience where their limitations are no longer a problem or constraint. As virtual reality begins its migration from scientific laboratories into the homes of the everyday user, the technology and prices of the devices should continue to become more affordable and relevant. This affordability allows more people to open their hearts and minds and allows them to begin to accept the fact that virtual reality will become a part of physically unique people’s daily lives, and could work to improve those lives. In the medical community, the promise of virtual reality seems to be well received and could be a successful and life-changing opportunity for many doctors and patients. The possibility that virtual reality could help those with severe or chronic pain is not a possibility that can go untested and should be further explored by medical and scientific professionals. If virtual reality has the possibility to help even one person manage and find relief from the incredible pain they suffer, then scientists and universities will continue to do all they can to ensure that the potential of this technology and affiliated devices is fully realized and able to help people. For the full effects of virtual reality to come to fruition, the vendors of this technology will need to be able to identify and target the correct market. Although the market for virtual reality is varied and constantly changing, the audience of video gamers and physically unique people will stay the same. Those people wish to immerse themselves in another world and reality and experience things that would be simply out of their reach without the help of virtual reality. For the time being, higher end and more expensive virtual reality software will dominate the media and industry, but as the technology becomes more efficient and affordable, cheaper software will become available for the everyday user. In addition to this cheaper software, other challenges for virtual reality development will be presented, such as how it will stay relevant, how the users will respond, and how it will determine its longevity in an ever-changing marketplace. Although virtual reality may not be useful to all those who are physically unique, it will provide an outlet to relieve stress, experience new adventures, and create new opportunities. Scientists and engineers are working tirelessly to help individuals with multitudes of different ailments with the help of this technology. For those physically unique people that do not have any negative side effects from virtual reality technology, it will be a life changing aid that will help them experience adventures and events they would otherwise have extremely limited access to. In addition to the opportunity for new experiences, it can also help alleviate symptoms for those who suffer from any kind of chronic pain disorder, recovering burn victims or those who are experiencing post-traumatic stress disorder and affiliated syndromes. In past studies, virtual reality has benefited physically unique children and many ways and going forward can only be of more help to more people. Sources last checked May 20 2018.